After two draws against the Schwarzgelben last season, Freiburg’s Christian Streich was looking to go one better and complete his 100th competitive win as a head coach – however, Borussia Dortmund vs Freiburg saw the hosts continue their dominant start to the season and extend their lead at the top of the Bundesliga table. For the past few seasons Borussia Dortmund have missed a central midfielder who can not only control games but be influential in their outcome. After the departure of Ilkay Gündogan to Manchester City there had been a hole yet to be filled – that finally looks to be history thanks to Axel Witsel. Since his arrival in the summer, the 29-year-old has been critical to the system operated by Lucien Favre. Striking up a partnership with Thomas Delaney, the Dortmund midfield now looks to be one of the strongest in Europe. His performances have been exceptional at times and this afternoon against SC Freiburg, the Belgium international had arguably his best game to date. Experience the Bundesliga – Book your European football travel now by visiting Nickes! From the start, everything Dortmund did seemingly went through Witsel. As the end of the first half approached the midfielder had amassed an amazing 69 touches of the ball and won all 100% of challenges he competed for – to put this in perspective, Freiburg had averaged just 28 touches each. When the game was complete, the Belgian had linked up with every team mate bar substitute Maximilian Philipp. Spraying the ball left, right, backwards and forwards. It was a complete midfield display and rightly earned him the Man of the Match from every outlet at the stadium. Each week the young Englishman seems to be in receipt of complimentary words from across the league – from TV to radio and throughout the digital sphere, and it’s with good reason. Once again, Sancho drove at the opposition back-line, twisting and turning – creating panic with every venture forward. 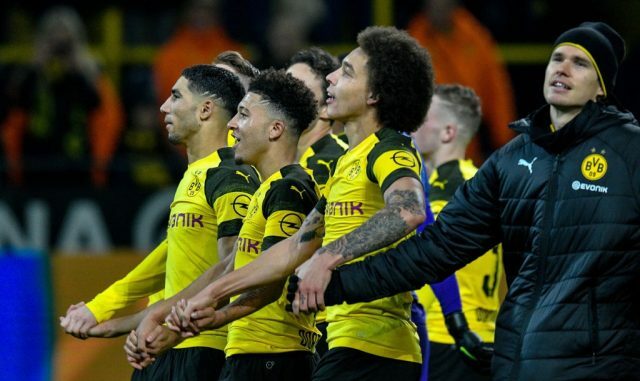 As Dortmund struggled to break down a resolute Freiburg back line it was no coincidence that on the two occasions they did during the first half, Sancho was involved in both. It was his tenacity and skill and that led to the hosts’ breakthrough. Forcing Dominique Heintz into a lunge that he didn’t need to make resulted in a penalty. The Freiburg defender lost his concentration through Sancho’s side step – the rash challenge let to a stamp on the 18-year-old’s foot. Once Dortmund began to assert themselves in the second half it was Sancho who became the wide outlet of choice, spinning past opponents like they were training cones. Christian Streich may feel a little unlucky to be leaving the Westfalenstadion without a point and with a two goal deficit to boot. 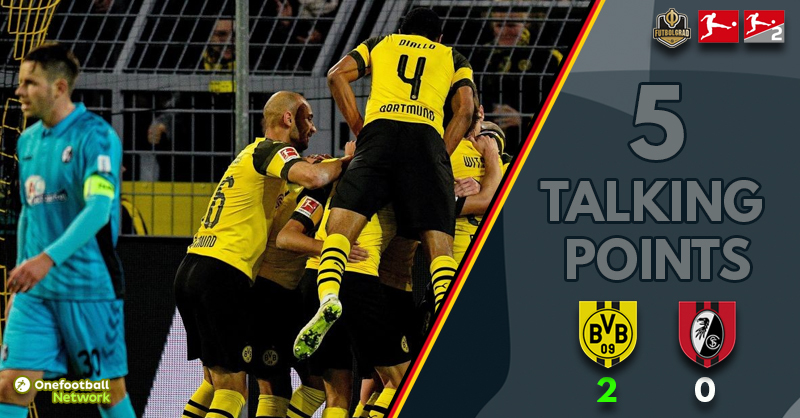 However, his Freiburg side caused Dortmund a number of problems that required the hosts to be at the top of their game. His decision to start with a 5-3-2 formation, then dropping to 5-4-1 out of possession, was no coincidence. Dortmund have struggled at times this season to break down two deep defensive banks, as witnessed in their games against Hannover, Hertha and Club Brugge – each side opting to load the back line out of possession. It almost worked for Streich, the opening goal came via an individual error and only the inside of the crossbar prevented an equaliser inside 60 seconds. Freiburg allowed their hosts the lion’s share of the possession while limiting them to a few clear chances. It was only the introduction of Paco Alcácer for the final quarter of the match that enabled the Dortmund to double their lead. After working exceptionally hard, and covering more ground than their hosts (120 km vs 115 kms), they put in a dogged performance that was only undone by two specific moments of absolute quality. 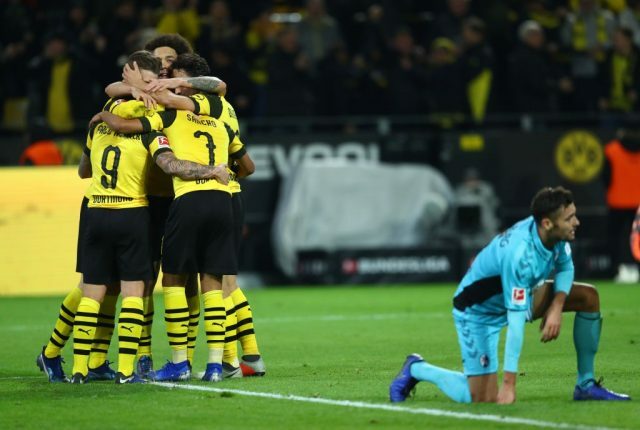 There is a feeling within Dortmund that this season might just be the one in which the Bundesliga Meisterschale returns to the yellow and black trophy cabinet, and those on the pitch now seem to be believing this. It is still only Matchday 13, there are a large number of games left and there will be – at some point – a wobble. However, it is how Dortmund deal with any setback that will mark out their title credentials. Over recent weeks they have taken on a key role that all champions elect need, patience – demonstrated again this afternoon. Freiburg made Dortmund work hard to fashion any type of opening, limited to just four opportunities on goal they made sure they netted two. Happy to recycle the ball and make their opponents work while out of possession, they eventually struck in added time to make the result beyond all doubt, but before that there was no forcing of the situation – it was all very calm, both on the pitch and in the stands. ‘The Joker’ – a German term for a ‘super sub’, and the 25-year-old Spaniard has become one of the most prolific Jokers in Bundesliga history. His goal in added time was the forward’s tenth of the season and his ninth from the bench. Alcácer hit this mark in only his eighth Bundesliga game, putting him equal with Gert Dörfel – who set the record in 1963 with Hamburg. His strike rate now has him averaging a goal every 30 minutes, a phenomenal return for any striker let alone one who was deemed surplus to requirements by Barcelona and was snapped up for just €23 million. He could prove to be one of the best buys in world football if he can continue to find the net with the same frequency over the entire season.